Tap on "Settings" wrench backlit button. Tap on last card labeled as “System”. The "Advanced settings" screen will open. 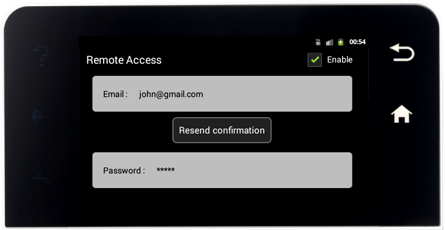 Tap on remote access card to open the "Remote Access" screen. Then tap on "Password" field. 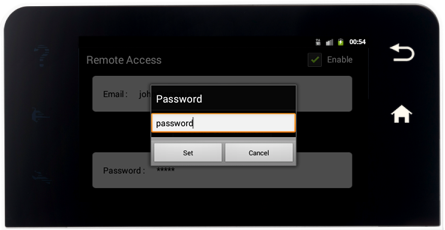 Enter your new password and tap the button "Set" to save it. Your new password is changed and saved. 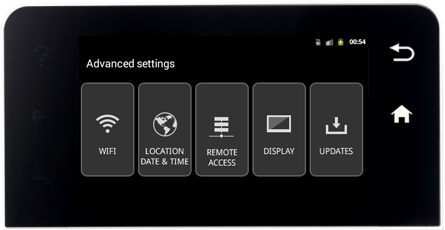 Use it to remotely access your RainMachine Touch HD device through mobile and web applications. IMPORTANT: Because the password is locally stored on the RainMachine Touch HD device, you cannot change the password through mobile or web application if you do not already know the password of the RainMachine Touch HD device.